Hands-On Video With Ubuntu For Android In Action! Ubuntu is one of the best Linux distros available in our eyes, and at least one member of the Redmond Pie team uses it as a means of building a home-made Time Capsule for backing up a Mac. On a slight tangent, let us know if you’d like to see a tutorial on getting that up and running! With Ubuntu offering a blend of the power of Linux and the usability of a GUI-based interface, we were particularly excited to hear that it had been made to work on selected Android smartphones. It seems Android fan site Phandroid felt the same, and they rushed on over to check it out a the ongoing Mobile World Congress event. The upshot? It’s pretty damn awesome. The demo itself was run on a Motorola Atrix 4G 2, which we all have to admit is one of the worst and indeed longest names we’ve come across. We’re not sure how they are going to do it, but Android phone makers need to come up with a more robust naming convention than adding numbers and oddball branding clichés to existing model names. But alas, we digress. While the makers of Ubuntu did say that a minimum specification would be needed in order to get the desktop operating system to run, they stopped short of explaining just what that would be. Phandroid suggests that a video out port, dual-core CPU and 1GB of RAM will be enough to see your own handset running Ubuntu in the near future. 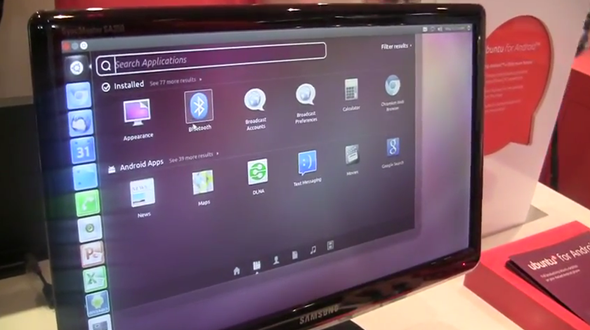 One thing to stand out throughout the demo is that both Android and Ubuntu seem to communicate with each other well. Photos and address book contacts are readable by both systems, which is great for those who want to edit their photos in Ubuntu having taken them in Android. It’s a little extra power and flexibility across a range of possibilities, and we like that a lot. The Ubuntu peeps also say that the smartphone version of the OS will receive updates alongside its desktop counterpart, and that all repositories will be open to the system, meaning apps can be installed at will. The best thing to do is just sit back and watch Phandroid’s demonstration, and then work out whether your particular flavor of Android handset will be able to power an installation of Ubuntu. We know you’re going to want to try it!